With our first night sleeping on the tent pad at campsite 80 behind us, we started day two of our trip at Petit Jean in great fashion – with a nice breakfast. After first reading Lonesome Dove 20+ years ago (and a couple dozen times since), I’ve always wanted to make dutch oven biscuits, outside, early in the morning. Since this was our first ‘official’ breakfast in our camping adventures, I got up a little early, started some coals and threw some Pillsbury canned biscuits in the dutch oven. It wasn’t exactly like Gus’ homemade biscuits, but hey, it’s 2012, not 1875. Uva Uvam Videndo Varia Fit, as Gus would say. I must say the buscuits were tasty, and well worth the ‘effort’ that Pillsbury put into packaging them.We made some coffee and had link sausage and scrambled eggs w/Pickappepa to complement the biscuits. It just doesn’t get much better than a decent meal to get your day on the right track. Following breakfast, we lazed around the campsite for a little while and Joe played with his new knight and dragon that Pops brought him. Later in the morning, we hit the first of several stops of the day at Cedar Falls Overlook. In years past, Cedar Falls was just that, falls. Due to very little rain, snow, etc. the falls are more like Cedar Trickle, these days. It didn’t help that we arrived during the middle of drought-ma-geddon. I won’t depress you with a picture, but this, is what it should look like. Still, the short trail to the falls has been redone since I was last there, and Joe really liked leading the way down. 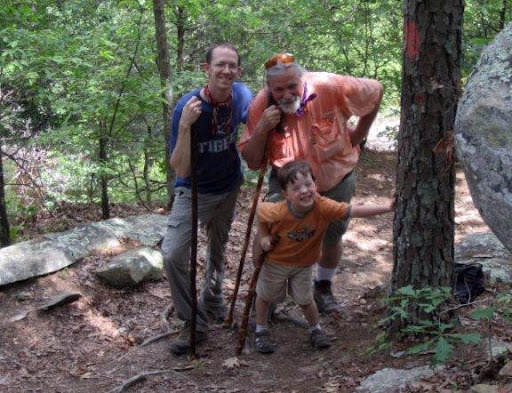 This is probably the most kid friendly (and now wheelchair accessible) trail at Petit Jean. It is a great way to start your trip, and you get a beautiful view of the falls and canyons below you. Here is a shot of Michelle and Joe at the falls overlook. In honor of Father’s Day, I thought I would reflect on a few lessons I’ve learned from my own father in regards to camping. For the dad’s out there, happy Father’s Day and I hope that you use this weekend to reflect on the immeasurable gifts of fatherhood, and that you are able to share some memorable moments with your kids. 1. Just Be: Whether you are preparing your gear for a weekend getaway, setting up your tent, making breakfast, going for a hike, or whatever it is, just be. Be mindful of your surroundings, be ready to accept things as they come. Be content with life in the woods, surrounded by bugs or uncomfortable by the heat. Be grateful for the opportunity to have a new experience with your family, and thankful to leave the world behind while you are doing it. It will all be there when you get back. Most of all, be present in the moment. In a blink of an eye, it could all be over – whenever and wherever you are, be there, and no where else. 2. On Coffee and Hatchets: “The coffee is ready when it smells like coffee…“ and “A hatchet is sharp enough when it is sharp enough to do the job you need it to do…“ Being an analyst, the simplicity of these statements was hard for me to process, but what Dad really meant was: “Son, you need to get out in the woods more often…”. Point well taken. 3. On Preparations: No matter how big your checklist, how thorough your packing job, or how much you “get your OCD on” about your trip, some things will inevitably a) be forgotten, b) not be needed, or c) be able to be re-purposed (my father is the KING of re-purposing). Whatever the case, it doesn’t really matter. Be ready to adapt and move on – when in doubt, see Lesson 1, and deal with it. Camping trips and life are too short to “sweat the small stuff” and both can be made or broken by how you deal with being outside your comfort zone. – adversities will arise. Just don’t forget the kids! 5. On Racoons: After being raided by a masked bandit on our recent trip, Dad had these words: “Heard him rumbling around about 3AM. I figured if he was crafty enough to break in to the cooler, he could have what was in it.” Luckily, the clever little robber didn’t make off with the beer. As I mentioned in the last post, our first camping trip has come and gone, and was a big success. 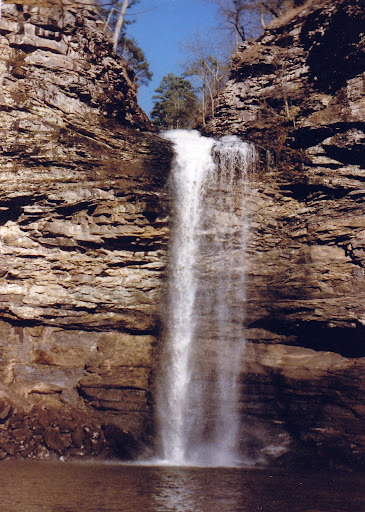 Of course, we went to Petit Jean State Park near Morrilton, Arkansas. Where else would I choose to introduce my little buddy to the adventures of camping? We stayed three nights and four days, and really did it up right, which is putting it mildly. The biggest reason for the success of the trip was all the pre-planning. After several weeks of scurrying here and there to look at and gather different gear, tools, supplies etc., when it came time to leave, we were sufficiently equipped with enough “stuff” to survive any calamity that the great outdoors could throw our way. It was quite comical looking back on it, but almost all of the preparations paid off. Here is a shot of Joe in the Explorer. As you can tell, we packed almost every square inch of the SUV. The Nesbit Hillbillies, maybe?